Jonathan Merritt grew up a child of the Religious Right. His father is a former president of the Southern Baptist Convention, and he attended Jerry Falwell’s Liberty University. Growing up, he says, he assumed that being faithful to Jesus meant defeating liberals. As he grew into young adulthood, however, he realized that there were Christians on the Left who saw things differently. Instead of switching from one political side to the other, he concluded that “[b]oth sides had accepted a faith that seemed more shaped by American culture than by the Christ I kept encountering in the Bible” (5). 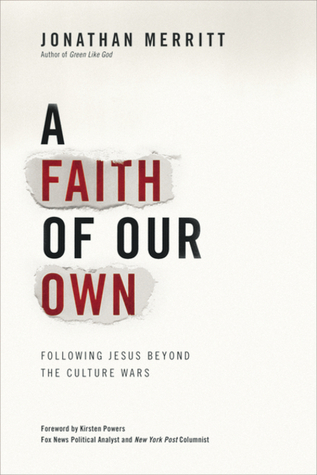 He set out to discover what it means to follow Jesus “beyond the culture wars,” and his book, A Faith of Our Own, is a record of his journey and the journey of others like him. Many on both sides lack a biblical framework for healthy engagement with the political process. Worse, few seem to consider the implications of their decisions. They know what might be accomplished by aligning their faith with a particular party, but they don’t realize the price that must be paid, the sacrifices that must be made (31-32). These shrunken understandings of God’s kingdom, leading to the reduction of the Bride of Christ to a voting bloc, constitute the failure of Christians of Merritt’s (and my) parents’ generation to engage the public square as Christians, rather than as the tools of some political ideology. As a result, Merritt notes, young people brought up in the Church are fleeing in alarming numbers, and those outside the Church are repelled by the marriage in many churches between faith and conservative politics. Not surprisingly, considering the movement’s influence and his personal background as part of it, Merritt spends more time critiquing the Christian Right than the Left. He memorably captures the dissatisfaction that many Christians in his generation feel about how the Church ought to act in public: “The culture-warring Christian… rushes off to fight the ‘war on Christmas’ and force the employees at Target to quit saying ‘Happy Holidays.’ A gospel-centered Christian says, ‘Christmas in America has very little to do with the incarnation of Christ anyway. Let’s focus our energies on what’s really important'” (133). Though he talks about “focusing on what’s really important,” Merritt doesn’t have much in the way of concrete proposals. His book seems intended more to capture the mood of the shifting evangelical culture than it is to chart a way forward, though in the second half of the book he does talk about the need for change to come from the bottom up, and the change he has seen in newer churches like the one he is a part of. I hope that perhaps in a future book he will be able to shed a more focused light on what post-culture-war Christianity ought to look like. I enjoyed this book, and flew through it in just a couple of days. Partly it was because Merritt’s message resonated with me. Neither of my parents have ever really had a “culture war” mentality, but growing up as part of the evangelical subculture in the South, it was hard to avoid. I have long since decided that it has done more harm than good to the Church of Christ in the United States, distracting people inside and outside the Church from the real work of the kingdom of God. I also appreciated that Merritt ended the book on a note of humility: he knows that his generation will make, and already has made, mistakes, the way every generation does. I hope he continues to document our successes and failures in such an engaging way.